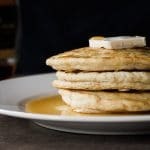 Easy and tasty vegan pancakes. In a small bowl mix the almond milk, flax seeds, vegan butter, vinegar, and vanilla together. In a large bowl mix the flour, baking powder, and salt together. Add the almond milk mixture and stir until combined, it’s okay if there are still small lumps. In a lightly oiled pan over medium heat, add 1/4 cup of the batter and cook until browned. Flip add cook until browned on the other side.